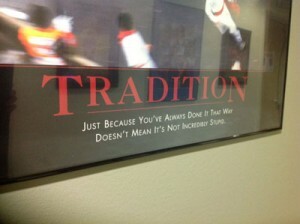 Tradition – Smart or Incredibly Stupid? Tradition – Just because you’ve always done it that way doesn’t mean it’s not incredibly stupid. How do you spend your time? Doing things they way they’ve always been done, producing little to no success for moving your business forward? Real life example: I coach a high school girls club volleyball team. An old technique of diving and rolling was deemed unsafe a few years ago. Girls were pulling muscles in their neck and spraining too many ankles. So the national association made a recommendation to change the dive and roll technique. Challenging to retain myself and then my athletes? Yes. Trying something new usually is. Rewarding? Of course it was. I was ensuring the safety of the athletes. We all have to try new things in other aspects of our lives – at one point you learned to drive a car, change a diaper if you have kids, swing a golf club, etc. – Why are we scared to try new things and break tradition with our businesses? Take a look at how you’re running your business and structuring your marketing plan. Do you need to break the tradition and try some new things to move your business forward? Be rewarded by investigating the benefits of what digital marketing can do to bring you more leads and make you more successful.